A Green Thanksgiving with Sorrel Soup | Laura's "Rules"
Green options at Thanksgiving are always a bit less exciting than the orange and brown delectables. I do love brussels sprouts, roasted, or braised in white wine and topped with gorgonzola, but they are not for everyone. And the green salad we always dutifully prep up is usually intact at the end of the meal, faring poorly against the competition. So why not kick off the meal with a lovely green soup? 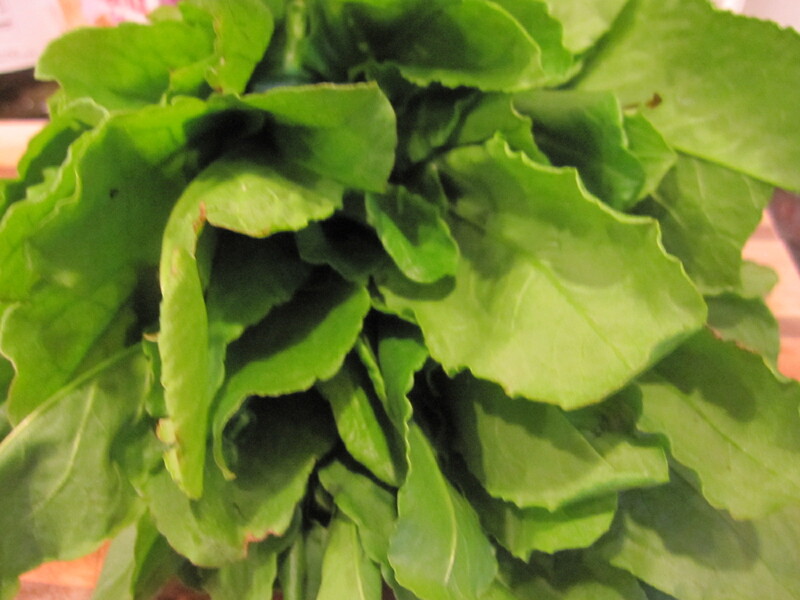 While sorrel is typically thought of in the spring, when it’s tender and new, autumn sorrel retains a wonderful lemony flavor, and can still be found in the farmer’s markets, at least where we live in Maryland. This easy soup is adapted from the mistress of gardens, Alice Waters, and her Chez Panisse cookbook. It can be prepared ahead, and finished at the last minute with a quick reheating and immersion (stick) blender. It has great flavor, and would make a remarkable — and elegant — way to open the feast. It goes without saying that this soup would also be wonderful chilled in the high heat of summer. You will want some really lovely fresh cream, so if you can obtain the grassfed, organic kind from a farm share or market, that’s the way to go. 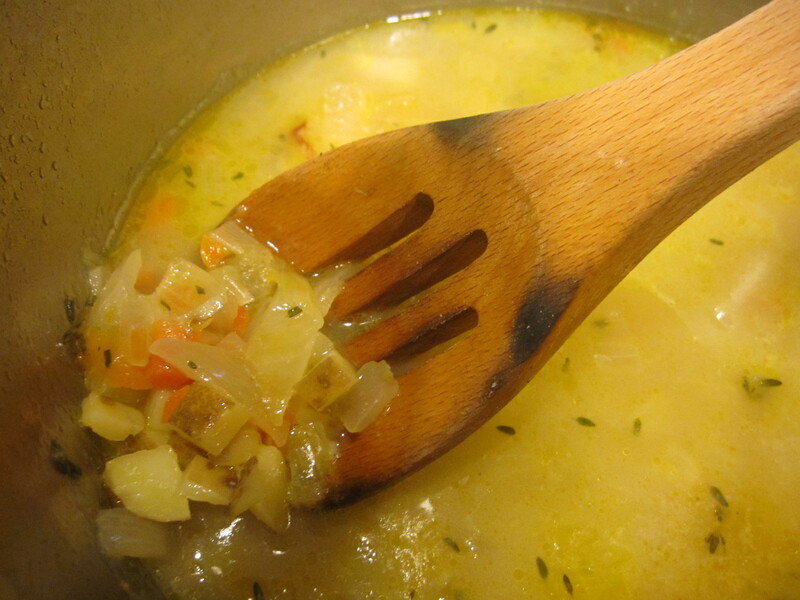 Melt the butter in a saucepan and add the thyme, diced potato, onion, and carrot. Pour in 1/3 cup of the water, cover, and stew gently for 15 minutes, with the lid ajar. Add the rest of the water (2 cups), salt and pepper, and stock, and bring to a simmer. Stew this for another 15 minutes, until the potatoes are soft and easily mashed. Purée the soup in a blender (glass is best) or use an immersion blender in the pot, then stir in the cream. Taste (and add more cream). Garnish with bacon and/or chopped sorrel. Serve and enjoy! This entry was posted in Recipes & DIY and tagged Alice Waters, chilled, cook, Cream, delicious, dinner, elegant, environmental health, fall, Family, farm-to-table, farmers, green, health, healthy, leafy green, market, Maryland, meal, mommy blog, organic, Purée, recipe, recipes, rich, savory, sorrel, soup, spring, Stock (food), summer, tasty, Thanksgiving, Vegetable, yummy by Laura MacCleery. Bookmark the permalink.